Experience SeaWorld® Orlando, the world's most popular marine life adventure park as well as Orlando's exciting water park Aquatica™ with this great value ticket! 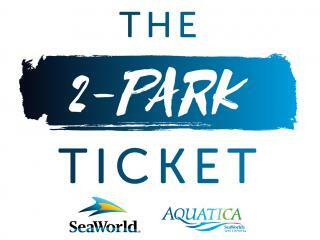 Costing less than 2 single day admission tickets, the 2-Park SeaWorld and Aquatica Ticket offers UNLIMITED admission to both SeaWorld® Orlando and Aquatica™ for up to 14 consecutive days. Tickets are activated the first time you visit either park. SeaWorld® Orlando is the world’s best loved marine park! Take a seat at the sensational shows starring Shamu®, enjoy up-close animal encounters and take the plunge on the thrilling rides including Manta that takes you face down through sea and sky. Embark on Florida's only Virtual Reality rollercoaster, Kraken Unleashed: Virtual Reality Experience, and make the Journey to Atlantis®, this one-of-a-kind water coaster takes you through this mysterious lost city, where you’ll experience one of the steepest, fastest, wettest drops imaginable! Aquatica™ is Orlando’s whimsical, one-of-a-kind waterpark that could only come from SeaWorld. Where slides spin and soak, including Dolphin Plunge® which will send you speeding past playful dolphins, to tranquil and rapid rivers and relaxing on white sand beaches. Prepare for an adrenaline rushing experience like no other on Ihu's Breakaway Falls™, the world’s longest drop tower multi-slide ride of its kind. Riders will drop down the steepest, tallest 360-degree spirals in the southern United States!